Got 20 minutes? 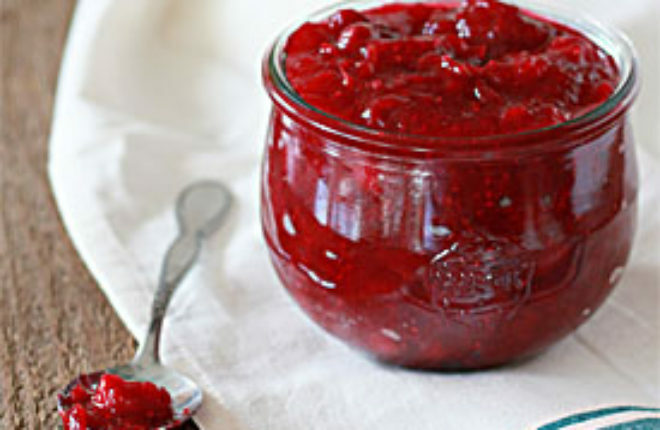 Make homemade cranberry sauce that beats the socks off of any you’ll find in a can. And when your friends and family have one tantalizing taste of your homemade fresh cranberry sauce, they’ll agree with you. Guaranteed. 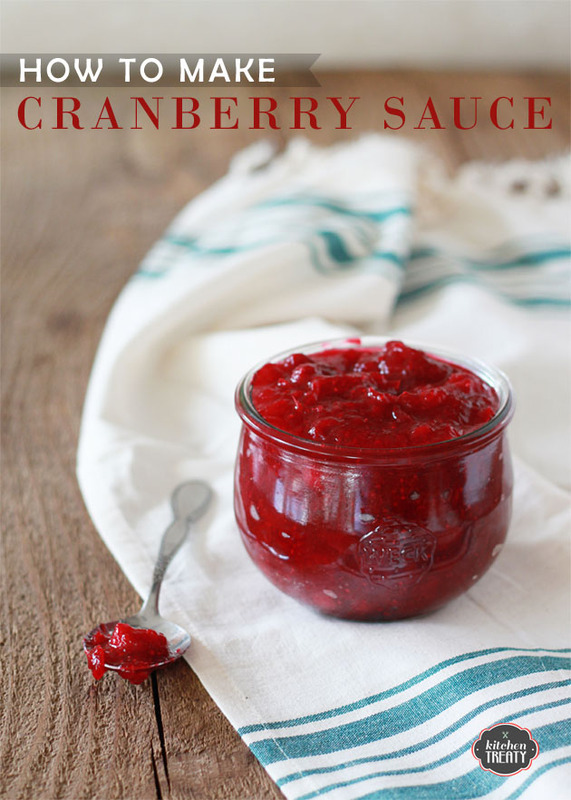 If you haven’t made homemade cranberry sauce, I have to tell you this: it is SO super easy. How easy, you ask? THIS easy. 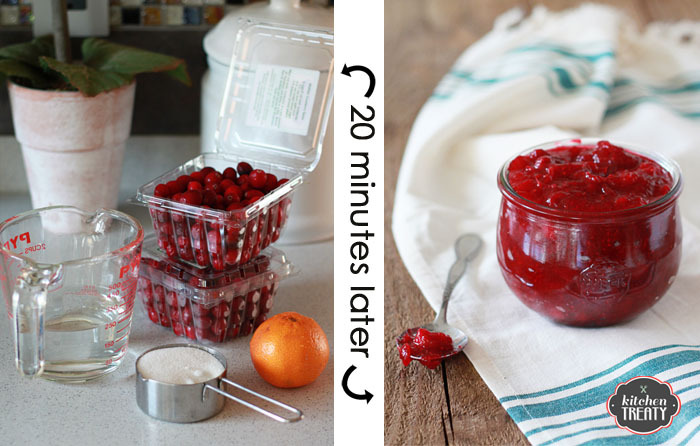 Even though there are endless wonderful variations of cranberry sauce out there, really you only need four things: fresh (or frozen) cranberries, sugar, water, and some orange zest or lemon zest. And then you need a saucepan, a stove, a spoon, and about 20 minutes. Find the cranberries in most any produce section. Ocean Spray sells bags of 12-ounce berries, or you may be able to find some in the organic section of well-stocked grocery stores. I found a local(ish) variety that I couldn’t resist. Take a quick look at the berries. You want the majority to be firm and smooth. If you find several mushy – or even moldy, ack! – berries, it goes without saying that you’ll want to pass on that bunch. Before cooking, rinse the berries and sort through, discarding any super-mushy or obviously unripe berries. Now, you’re ready to cook! Place a medium-sized saucepan over medium heat. Add 3 cups of berries, 1 cup of water, 1/2 cup of granulated sugar, and 2 teaspoons of orange zest (you can also go with 1 – 2 teaspoons of lemon zest if you prefer). Cook, stirring occasionally, over medium heat until the sauce comes to a boil. Continue to let the sauce boil until the sauce gets juicier and the berries burst and break down, about 15 minutes or so. And you know what? That’s pretty much it. There’s your sauce! One more crucial step, though. Taste the sauce! 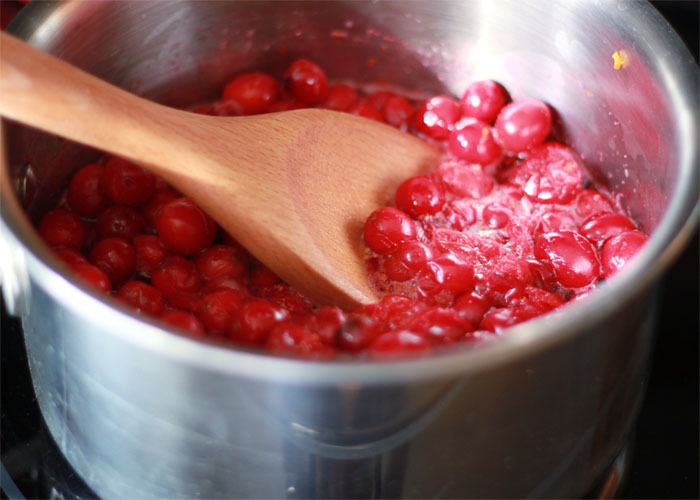 I suggest you start out with a fairly low amount of sugar because cranberries can differ in sweetness. 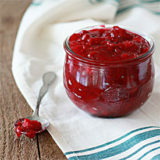 Now’s the time to taste it and, if it’s too tart, add more sugar about a tablespoon or two at a time until the sweet/tart balance is just right. Individual tastes can vary, but I like it to be sweet with just a little teensy bit of puckery tartness that lingers. Once you’ve found the perfect amount of sugar, stir and cook for another minute or so to make sure the sugar dissolves. Remove from heat and let cool, then spoon into your serving container or an airtight container for storing. The cool thing about homemade cranberry sauce on Thanksgiving is that you can make it WAY ahead of time. It’ll keep nicely in the refrigerator for up to a week, or freeze it for a month or more. Just pull it out of the freezer and put it in the fridge a couple of days before Turkey Day and voila! You’re done! 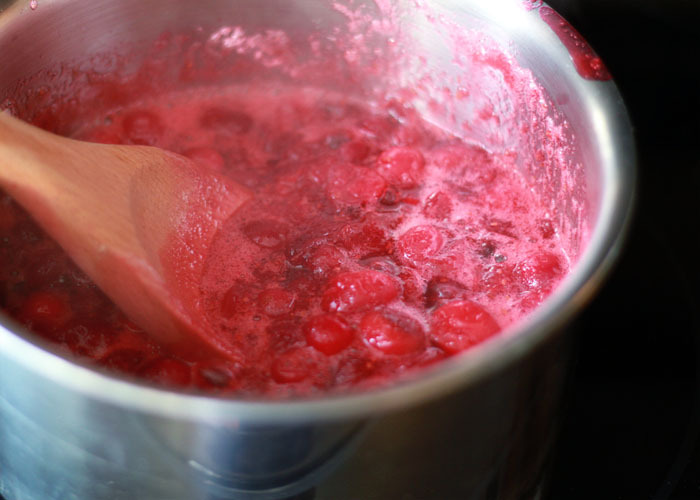 Here’s a video that show you how easy it is to make cranberry sauce. Find all of the recipes here! Rinse and sort the berries – if any are super mushy, discard them. Place a medium-sized saucepan over medium heat. 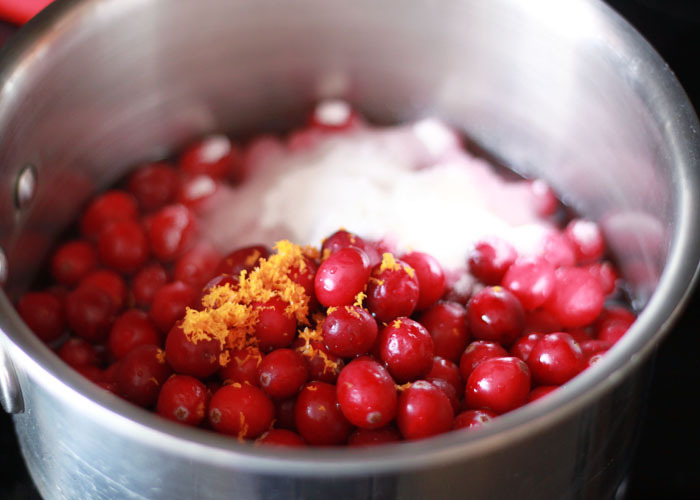 Add cranberries, 1/2 cup sugar, orange zest, and water. Cook, stirring occasionally, until the sauce comes to a boil. Taste for sweetness. If it’s too tart, add more sugar – about a tablespoon or two at a time – until the sweet/tart balance is just right for you. Keeps for up to one week refrigerated in an airtight container, or for up to two months in the freezer. Use pure maple syrup or honey (if not vegan). Be sure to use vegan sugar or substitute pure maple syrup. Been making my own cranberry sauce for ages. So easy! In fact my kids have taken over this particular recipe now– it’s an easy Thanksgiving recipe for the younger set to start off with. Thanks, Mary! Getting the kids involved with this one is such a fabulous idea. Great recipe! I have used one very similar for many years, and have tried to cut down on sugar. Since the sugar causes it to “gel” making it hard to cut back much, I recently tried a waterless recipe. Just the berries and (less) sugar, which sauces up once the berries pop. Turned out great! I confess that I do add a spoonful or two of orange juice concentrate because I like the fruit sugar and orange flavor with the cranberries. If I’m substituting maple syrup for sugar, is it the same amount? Thanks! I’m going to try it!! 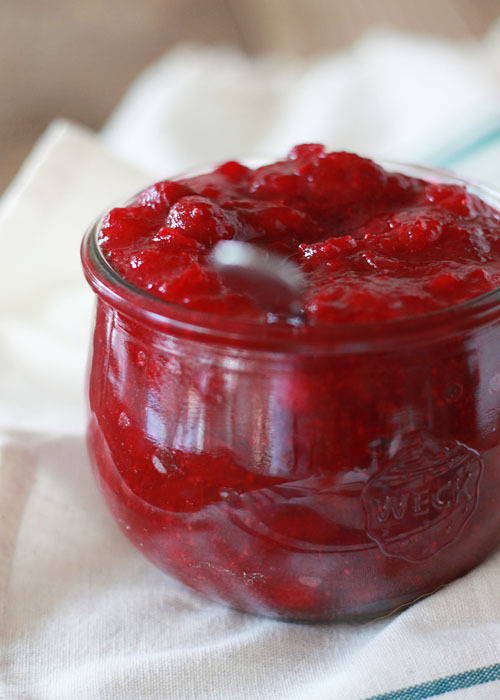 This is the first time I make cranberry sauce and this recipe was perfect. I actually wanted it for filling a cake, so I added more sugar and the mix was a bit thinker than usual but that was actually better for what I needed it! Thank you for a simply yet delicious recipe! Thanks so much for your review, Leonor! Oh man, I bet that cake was absolutely fabulous.